Modern architecture and design trends have a sleek and bold appearance. Clean lines and minimalism are at the order of the day. The challenge with our contemporary design is often to make different parts or constituents integrate entirely with the whole. Strong, geometric shapes and modern materials are not always conducive to the effortless flow of energy from one space to the next. The Casa 26 is a project undertaken by Patricia Ho Architecture + Art, based in Curitiba, Brazil. 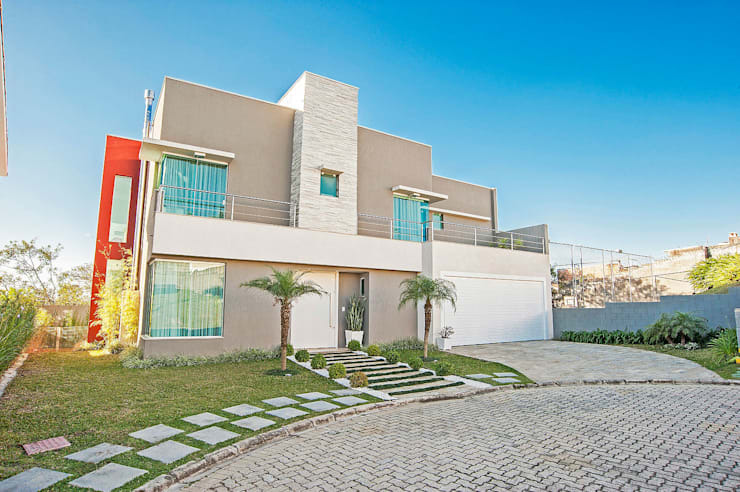 The house, which covers an area of 265 square meters, is located on a cul-de-sac and a plot of land perfectly suited to the home’s dimensions. Straight lines dominate the design of the façade, creating an overall uncomplicated design and appealing first look. We can see a tessellated theme prevalent throughout the presentation of the property. This is seen in an asymmetrical fashion on the façade of the home itself, as well as in the pavement of the driveway and the walkways of front garden. 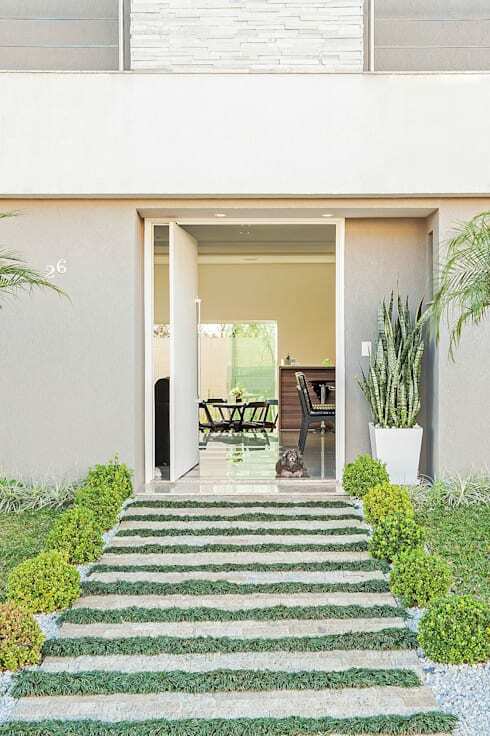 Standing in front of the entryway of the house, we can see a very structured design, softened by a specific colour palette and natural elements to create an inviting appearance. The lower level of the house is divided by the one above it through a bold, broad strip of white plaster – a band that wraps across the front of the façade and serves as the base of the balcony found on the second floor. Here, this element demarcates the height of the main doorway. Leading up to the door itself, there is a strip of elongated stone slabs, each the width of the doorway, and placed parallel to one another to serve as a stepping-stone walkway up to the entrance of the house. The spaces in between these slabs are beautifully coloured in by a rich, low-growing shrub. Quaint, spherical hedges punctuate this walkway on either side. Moving inside the home, we first have to take a moment to appreciate the freshness and beauty of an indoor garden. We’ve already seen that there is an emphasis on natural elements with the façade and entryway of this building, but here we can see that nature is just as important in the interior. A half-landing staircase leads the way from the first floor to the second. 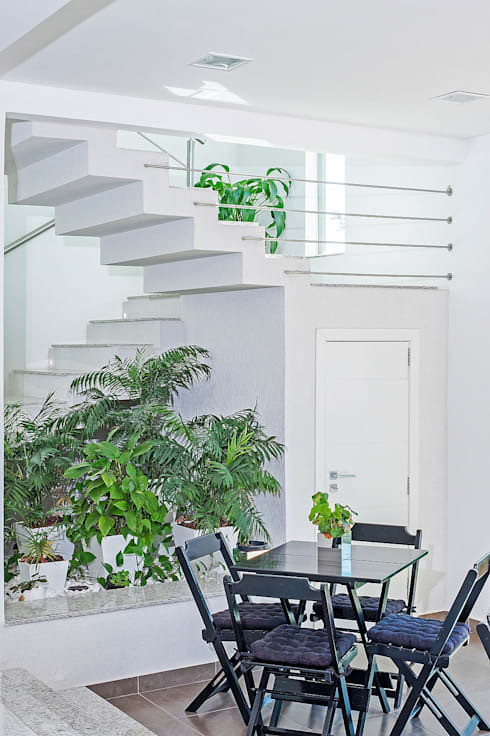 Instead of leaving the area beneath the second flight of stairs to be dead space, as is usually the case with such designs, the designers incorporated a potted garden of lovely plants. This intense ensemble not only beautifies and oxygenates the environment, but it also takes up no further functional space which could have been otherwise used operationally. Here are some more ideas on how you can: Creatively use the space underneath your stairs! This view of the dining room table and spaces behind it, provides us with a good summary of the Casa 26’s style: simple, elegant and sophisticated. Simplicity is often the most stylish option, as we are well aware of in examples like the classic Chanel suit, or the architecture of Frank Lloyd Wright. The interior designers of the home followed this good advice of the ages, and with a selection of uncomplicated, yet luxurious materials, created a sophisticated living space. 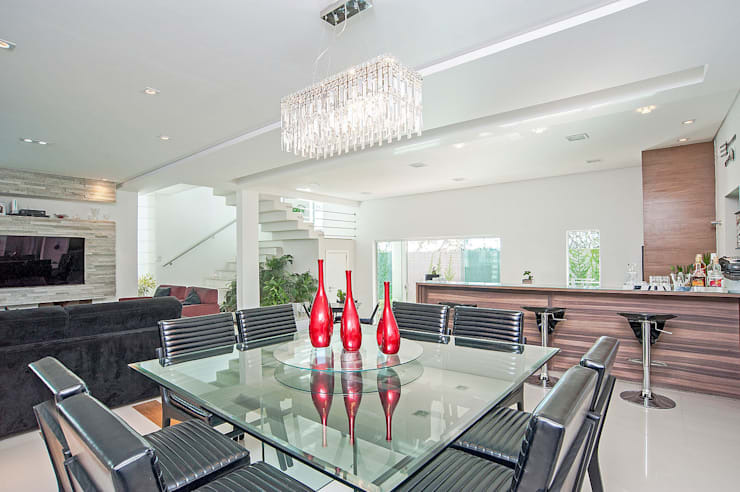 The glass dining table is complemented by black leather chairs, and the area is rounded off by an elegant crystal chandelier. Three striking red vases decorated the table, and is the only splash of colour in an otherwise neutral area. At the back of the image we can see the counter of the kitchen, coated in timber planks – subtle and suited to the neutral atmosphere of the interior, dotted in certain places by luxury items. Here we now are on top of the landing of the staircase we viewed before, or rather the lovely garden beneath said staircase. Since this feature of the house has many noteworthy attributes of its own, we could not pass up the chance of a closer inspection. The stair treads and the landing are made of quartz, layered on top of the concrete structure of the staircase. This material gives the area an elegant and luxurious appearance, reminiscent of regal halls coated in marble. 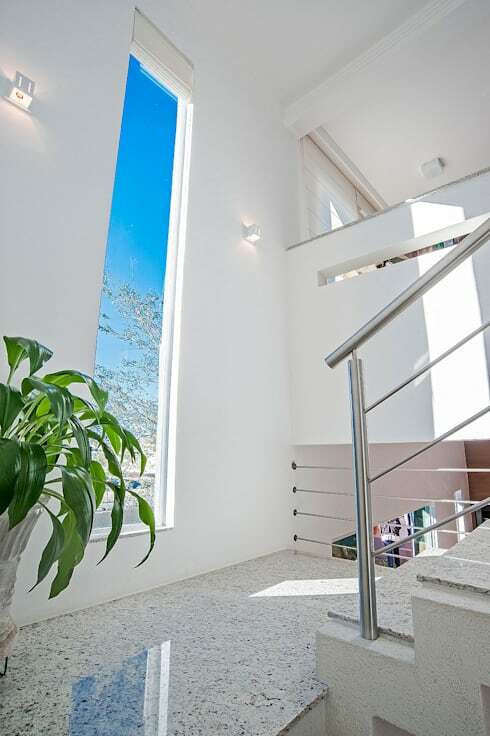 The banisters are of stainless steel, just to add that modern edge to the composition. Now we end our tour of the Casa 26 today in the most intimate of rooms: the bathroom. 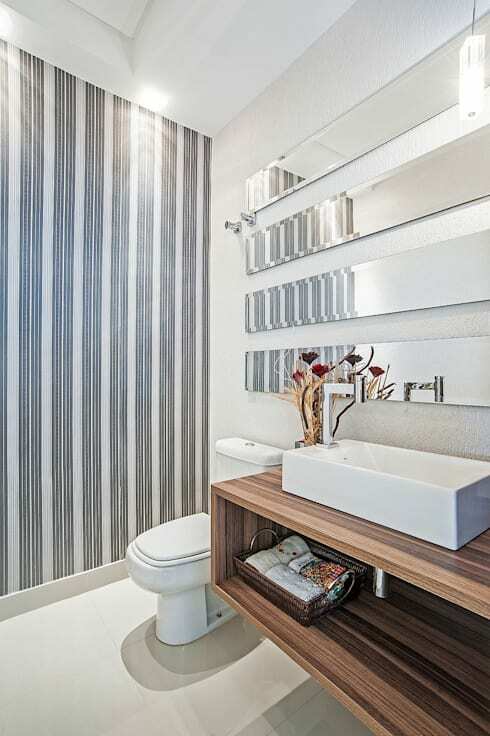 In this modern design we can see a clear theme coming to the forefront, that of stripes. It’s on the wall, it’s in the material, and it dominates the accessories. The wallpaper, which is only used on the one wall, consists of vertical pinstripes in shades of grey, elongating the sense of height in the room. To the right we can see the counter on which the basin is situated, and it is made of wood with a defined vertical pattern across it. Finally we can see the mirror at the back of the basin, which is actually a set of four elongated mirrors places parallel to one another, reminding us of the patterns we saw at the entryway. We thus end off our view of the house with the same impressions we saw at first: tessellation, structure, harmony. The integration of different elements in rooms, as well as the integration of different rooms across the house, creates balance and rhythm throughout the building.